Napiště prosím požadované příchutě produktů do poznámky k objednávce, jinak budou vybrány náhodně. 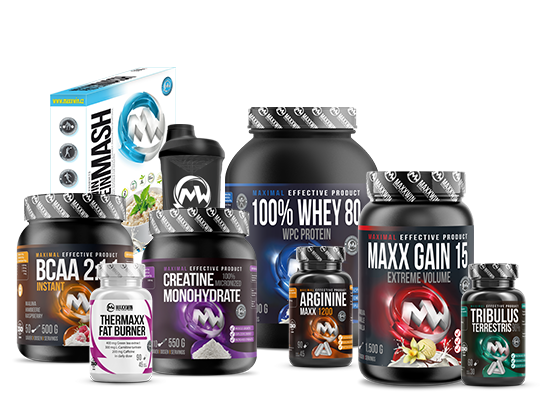 Best and professionally selected package of quality MAXXWIN products, specially designed for reduction of body weight and fat. It is suitable for both amateur and competitive athletes. Products in the package are significantly cheaper than if bought separately. The package contains instructions with recommended use this combination of supplements. DIET DRINK is a dietary cocktail containing all the ingredients needed for your healthy lifestyle! After the consumption, it provides satiety feeling, and supplies the body with important substances. SYNEPHRINE MAXX is an supplement used for burning fats and decreasing weight. Speeds up metabolism and increases calorie burning. L-CARNITINE + HCA + CHROM is and dietary supplement for fat loss, cholesterol levels in the blood adjustments and appetite reduce. PROTEIN MASH is designed as sweet energy breakfast or small food during the day. It&apos;s unique composition secures protein intake and deliver necessary amount of energy in easily digestible form.